Breakfast pastries are near and dear to my heart. A few years ago I had a catering business where I mainly served breakfast, so yeah I love making breakfast. I took the opportunity to practice with a lot of doughs and experiment with different breakfast sweets. Best thing was I had a hundred people every morning who loved sweets. My Best-Ever Sticky Buns recipe was born at this same time and now I get to share it with you! Similar to a lot of my doughs I have made previously, this is a No Knead Dough, which means you don’t need to knead the dough on a machine to develop the gluten. You just need to mix everything by hand in a bowl and then leave to rest. The fermenting period will develop the gluten for you and also the flavor. It really is that simple. A benefit to this dough is that after only 4 hours of fermenting you are free to use it. If you don’t want to use it yet after the 4 hours you can put it in the fridge for up to 3 days. The extra fermenting and time will give your dough even more flavor. Are you a breakfast connoisseur like me? If so, I recommend checking out my no knead Cinnamon Rolls, Homemade Croissants and other Bold Baking Breakfast recipes. 2 teaspoons Fast acting dried yeast or Instant yeast. In a large bowl combine the flour, yeast and salt. Set aside. In a separate jug, mix together the milk, honey, butter. Pop in the microwave and gently heat for a few seconds until the mix is lukewarm and the butter is melting. Once the butter has melted quickly whisk in the eggs until combined. You want to make sure the mix isn’t hot otherwise the eggs will cook. Pour the wet into the dry and mix until it forms a dough and all the flour is mixed in. It only takes a minutes to mix the dough together. Cover with cling wrap and allow to rest at room temperature until the dough rises for a minimum of 4 hours. After the 4 hours you can place it in the fridge for up to 4 days. For the filling: Mix together melted butter, brown sugar, honey and cinnamon. Set aside. 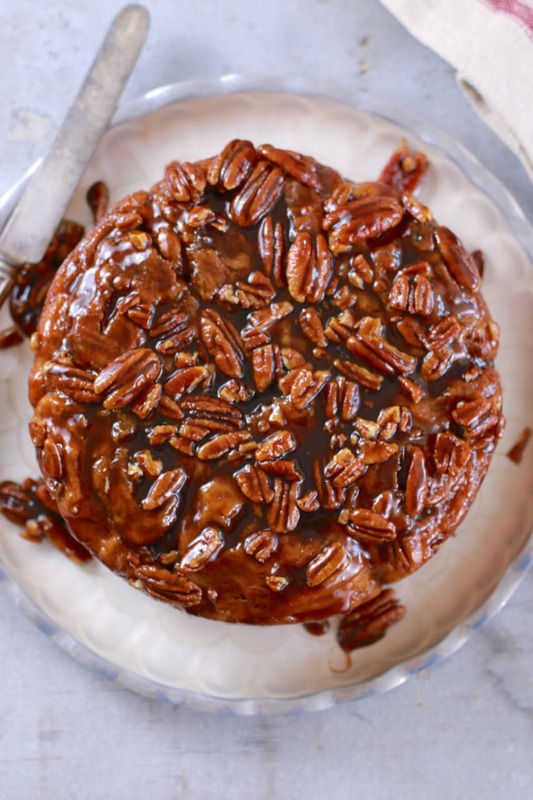 Using a 9-inch cake pan, with a spatula spread half the caramel mixture evenly over the bottom and all over the sides Scatter the pecans over the caramel mixture and set aside. With the remaining caramel mixture evenly spread it over the rolled out dough leaving 1 inch around the edge of the dough without the filling. Starting with the long side, roll the dough into a log. Roll it over until its seam is underneath. Using a serrated knife, cut the log into 2 ½ inch rolls (around 8/9 pieces). Arrange the rolls over the pecans in the prepared pan, so that the swirled cut edge is facing upward. Preheat the oven to 350oF (180oC) and bake for roughly 40 minutes, or until golden brown and firm in the center. While still hot, run a thin spatula around the outer edge of the pan to release the caramel rolls, and invert immediately onto a serving dish. If you let them set too long they will stick to the pan and will be difficult to turn out. Enjoy warm! Make the dough in advance and place in the fridge for up to 4 days. My third recipe of yours I have done. Very happy! Thank you. The carmel seemed to soak into the buns as a liquid instead of a soft carmel on top. Any thoughts from your experience? hum, David I’m not 100% I understand why it would do that.I haven’t experienced that before. As long as you did the same quants as I did I’m not sure why it would all soak up. What exact type of dry yeast? fast rise / quick rise / rapid rise, something else? Yeast confuses me way more than it should. Fresh or Compressed Yeast: This should only be bought in amounts that will be used quickly. Fresh Yeast comes in small square cakes and is perishable. If not used right away, it can be stored in the refrigerator up to 3 days. It can also be frozen. One cake of Fresh Yeast equals one envelope (9g) of dry yeast. Dry Yeast: It is the most convenient of the two types. It is granulated and comes in little 1/4-ounce packets, 9 g. (approximately 2-1/4 teaspoons) or loose in a jar. Once exposed to the air, it should be stored in the refrigerator. This one needs sponging in most cases. Instant Dry Yeast: This is the one which can be added directly to flour, and does not need sponging. If in doubt about the yeast you have sponge it, then you cannot go wrong. This means activating the yeast, usually in the liquids to be used in the recipe. Normally you would bring the sponging liquids to blood temperature, that is when you put your finger into the liquid it should feel neither hot nor cold. A touch of sugar, or honey will speed up the activation. This is really ‘proving’ to you that the yeast is good and active. A foam will form/sponge on top of the liquids after 5 mins or so, you stir this through before adding to the flour. Add ¾ in one go, then the remainder until the dough comes together in a clean ball. Using a mixer: If you are using a mixer with a dough hook, you should have a ‘foot’ form, attaching the dough to the bottom of the bowl, this will ensure a good texture to the dough. If it seems over-wet, add more flour. Do you think a gluten free 1-1 flour would work? Fantastic! I have a relative that is known for her sticky buns … and these turned out better than hers ever have!!! Great recipe and easy to do! These were not even close to as good as my sticky buns. Crazy recipe. WAY to many pecans. Not a good texture. The only thing I liked about them was the topping, which I wouldn’t use as filling — again, my way tastes much better. HUGE disappointment for something called “best ever”. I am sorry you did not like this recipe, I am not sure why it did not work out well for you. Thank you for taking the trouble to let us know. I’ve not made these yet but will today. Does anyone know if you can use self rising flour? It’s best to use the flour that is called for. Self raising flour should only be used when the recipe specially calls for it. I have now made these rolls 4 times. The first two times the rolls came out amazing. The bread was moist and sweet. The last two times, I don’t know what I did differently, but the bread/dough part tasted not very sweet and flour-like. It was also more crumbly. The yeast worked both times on the bad batches since the dough rose nicely after sitting at room temperature and again when I proofed it. The second bad batch, the dough was more sticky but I purposefully added less flour when I rolled it out since I was worried it would be too dry. What else could it be? Did I somehow buy the wrong flour? Oh dear! I have no idea what changed here. I can only think there was a change in the ingredients. I think it will not have been the flour as it proofed nicely for you. I am wondering about the honey and butter, was this what you used in all of the batches. The salt also matters. Good, I am delighted you found your way with this recipe, well done, perseverance is everything. My dough was very sticky and wet so I added more flour. After it baked I tried them. They were delicious and the honey gave them a nice touch. However I felt like the buns were bread-y like a little dry. Could it have been because I added extra flour? Yes i would say so, it is a wet dough. But sounds like they still came out lovely. Great job!